1/ There's one thing that explains a large part of the current "tech backlash": the idea that all workers need to seek a higher level of skill. We often hear politicians / economists lecture us on the importance of lifelong training for desperate workers who just lost their job. 2/ Western countries are the worst in that regard. That's because for them economic development during the 20th century has been synonymous with an ever more educated workforce. No wonder why lifelong education has dominated the political course so much in recent decades. 3/ But there are several problems with "more education" as the solution to every problem. Remember Tony Blair's "Education, education, education"? People were thrilled at the time. Today, they can't stand it anymore—and they're right: it didn't work! 4/ Another problem is that even if people believe in a higher level of skill, many see themselves on the wrong side of history: when you've lost your job as a factory worker, it's difficult to imagine that you can acquire the skills to become a software engineer one day. 5/ Indeed what is worse than "It doesn't work"? This => "It works for everyone *but me*". 6/ The reason, by the way, is because immigrants, especially if they have a low level of skill, are ready to accept jobs that most locals won't even consider. 7/ There's a third problem: it's simply false to assume that more education for everyone is the solution to massive unemployment and widening inequalities. We need to realize this: there will be many jobs in the future for "low-skilled" workers. But those will be very different. 8/ In the past, attractive jobs for "low-skilled" workers were concentrated in 2 worlds: factories and bureaucracies. 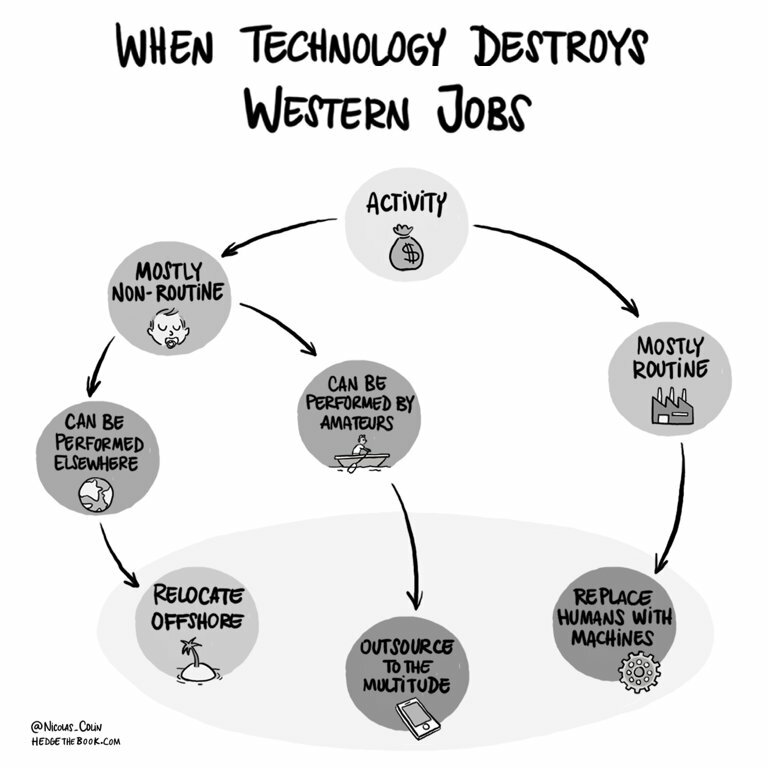 Alas those are precisely the jobs that have been destroyed by globalization and technology. 9/ In the future, most jobs for those currently seen as "low-skilled" won't be in either factories or bureaucracies, but in organizations dedicated to providing care to customers: I call them "proximity services"—sectors that employ what @Richard_Florida calls the "service class"
10/ There are 2 obstacles on the path to redeploying the workforce toward proximity services. 11/ Obstacle #2 is that we're collectively headed in the wrong direction because we're mentally stuck in the past—in the old age of the automobile and mass production. Most people are told that they need to go back to school to climb up the social ladder of the Fordist economy. 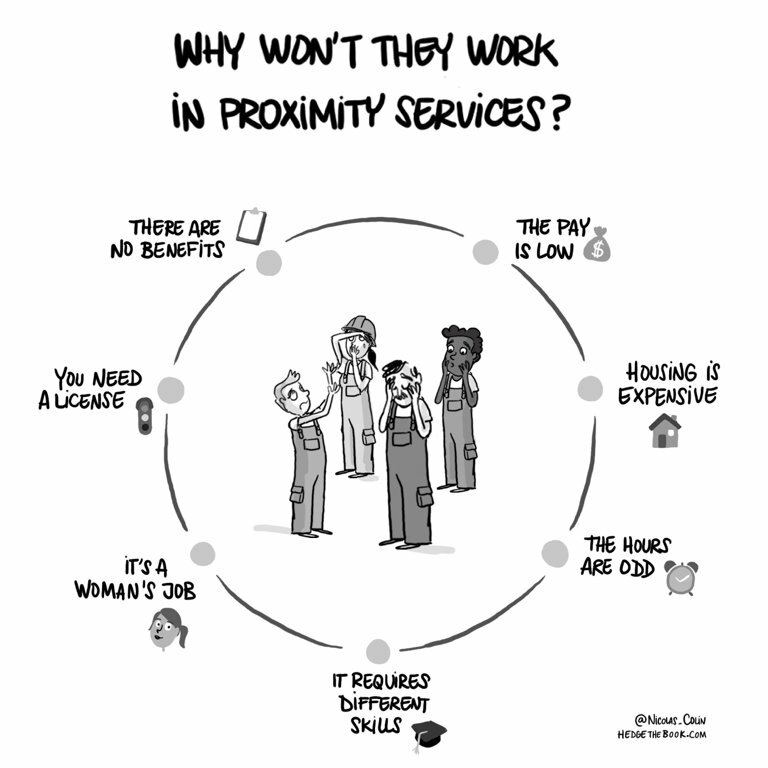 13/ As a result, all those people are missing the opportunities provided by the new age of ubiquitous computing and networks—not factory jobs, but jobs in proximity services: education, healthcare, personal care, retail, hospitality, urban logistics and transportation, etc. 14/ It's easy to sympathize: a middle-aged factory worker has a hard time seeing themselves becoming a child carer, a Starbucks barista, or a nurse. 15/ I'm not saying that workers shouldn't pursue the opportunity of becoming developers and software engineers.